DSC James Langton and DI Anna Travis are back again investigating a murder in Above Suspicion 3. Their last case ended on a bad note, with a suspected drug dealer escaping justice. The higher-ups in the police force were looking for a scapegoat, and they seemed to suspect that DSC Langton was the one at fault. His expected promotion to Commander has been set aside, and Sam Power (who wasn't even seeking the promotion) was given that position instead. So when popular young actress Amanda Delany is found stabbed to death, Langton is put in charge of the investigation. In addition to solving the murder, he also has another objective: to find out which of his colleagues put the blame for the earlier failed investigation on him. Amanda Delany seemed to be living a life that many would envy: she was young, beautiful, successful and admired for her many film roles. However, her life was anything but happy. When she was found murdered, the autopsy revealed that she was suffering from anorexia, abused drugs, had numerous scars from self-harming, and that she'd already had a total hysterectomy at the age of 24. As the team begins investigating her murder, they find no shortage of possible reasons someone might have wanted her dead. Amanda had a habit of having short-lived affairs with her male (and usually married) co-stars. Her ex-roommate blamed Amanda for stealing roles and ruining her own acting career. Amanda was involved in the drug scene, and several of her acquaintances also end up dead in drug-related circumstances. Finally, Amanda had been in contact with a publisher about writing a tell-all autobiography which would "name names" and make a fortune. Did someone not want their secret to be revealed? As Langton works on solving the case, he feels more pressure than usual to get a quick result. It's been implied that if he solves the case quickly, he might eventually get that promotion to Commander after all. At the same time, DI Anna Travis has been told she's on the "fast track" for a promotion. Her own determination to get answers without always following protocol will put her in personal and professional peril. 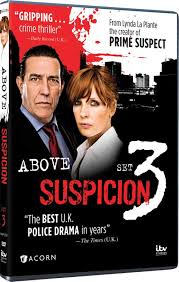 Above Suspicion was written by Lynda La Plante, most famous for the long-running Prime Suspect series starring Helen Mirren. This series also stars a woman who is working in a male-dominated police force (although things are vastly improved from Jane Tennyson's day! ), yet trying to make her way up through the ranks by determination and hard work. Anna Travis also has something of a soft spot for her superior, DCS Langton, so it remains to be seen how their personal and professional relationship will develop. This series takes place over 3 episodes. The disc also includes many extras, such as interviews with the main cast, guest cast, writer, director and producers. It's very interesting to get such a thorough behind the scenes look at the production and how many people are involved in it! At one point it was mentioned that at least 2 more series have been written, so we can look forward to more visits with Langton and Anna! Love Above Suspicion- this is what got me hooked on the very talented, gorgeous Kelly Reilly!